The AGITG Annual Scientific Meeting accepts abstracts and posters for submission to the Best of Posters and Fast Forward awards, sponsored by Clinical Genomics. The winner of the Best Poster Award receives $3,500. In the Fast Forward Session, presenters have just three minutes to present. The Best Fast Forward Award winner receives $1,500. Dr Belinda Lee was awarded the 2018 Best of Posters Award for her poster titled Pancreatic Cancer: An analysis of ‘Real-World’ stent-related morbidity in the palliative setting. The Best Fast Forward Award was awarded to Dr Hui-Li Wong for her abstract Biomarker testing and biomarker-directed treatment utilisation for metastatic colorectal cancer in Australian practice. “At Clinical Genomics, our commitment is to enhance cancer patient care through early detection,” said Dr. Frederick S. Jones, Vice President, Medical and Scientific Affairs, Clinical Genomics. “We are proud that this contribution for Best of Posters and the Fast Forward Award is able to help recognise excellent research and positive outcomes for patients”. 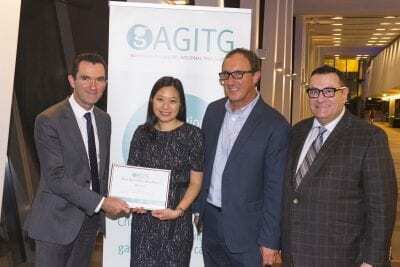 Image: Dr Belinda Lee receiving the Best Poster Award, pictured with AGITG Chair Prof Tim Price (left) and Clinical Genomics Vice President, Medical & Scientific Affairs Dr Frederick S. Jones (right) and Clinical Genomics Chief Medical Officer Dr Tadd Lazarus (far right).